This week's Photoset Friday is a gem. 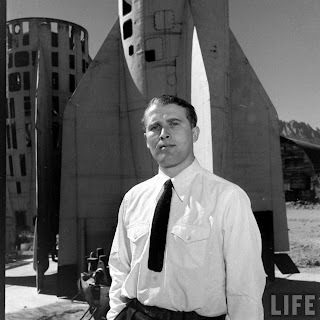 Shot by Thomas McAvoy in 1946, it is entitled "German Scientist, El Paso." It follows around the Operation Paperclip rocket scientists from Germany and chronicles their new life in America. Among other things, they bowl and eat in the cafeteria. And of course, there is the titular German scientist, pictured above. Can you guess who he is?